Do you hate your Lightning cable? You wouldn't be the first. Then again, there might not be that many of you out there: Apple's introduction of the eight-pin Lightning connector inspired a sizable amount of kvetching, despite the fact that the company said it was necessary to make the iPhone 5 thinner. For starters, consumers who wanted the upgrade needed to replace all their cables (for $19 each) or buy an adaptor (for $29-39), which wasn't even compatible across Apple devices. Now, a year later, some people are still pissed. 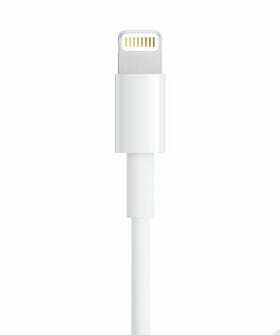 According to Businessweek's Sam Grobart, the Lightning cable is "far and away the worst-reviewed" Apple product on its site. Grobart cites users complaints of frayed cables and broken connectors, and slightly hyperbolic comments like, "I hate this thing with a passion of 100 suns." He notes, however, that Amazon reviewers are much happier with the product than those on Apple's site. Does that say more about Apple fanboys and fangirls than about the cable itself? Or, perhaps the nature of people who leave online reviews? This writer has personally never had a problem with the Lightning cable — and plenty of problems with the previous 30-pin connector — and has never felt the urge to say a peep either way. But, everyone's different.